It happens sometimes. Humans make mistakes. Even factory run completely by robots are not infallible. When your primary shopping is online ordering, you’re going get a few mishaps. I have been able to find all but one – Nuk trendline BabyTalk. There’s a contemporary aqua/purple design, but I needed the older pink/purple version. I found them listed on Amazon for $35, shipped. More than I wanted to pay, but the description was exact: Nuk Brand, Trendline Collection, Baby Talk Design, Girl Colors. 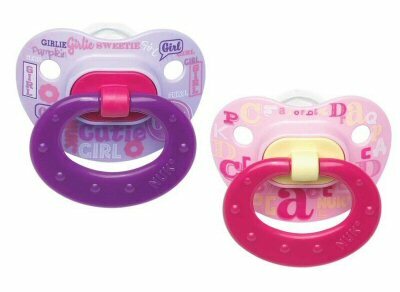 The design was no longer being manufactured, making the binky effectively a collector’s item. This seller seemed to know that, and was charging the collectors price. At least I would be sure I was getting the right one. My heart sank when I opened the box. Inside was a pair of solid color, translucent blue binkies. Not Trendline. Not Baby Talk. Not girl colors. The only similarity the item I received had in common with the product listing I ordered from was that they were both Nuk Brand. I contacted the seller, who informed me that the design was no longer being made so the warehouse sent me the same product, just a different color. The interesting thing about the exchange was the acknowledgment that the warehouse intentionally sent a different item rather than cancel the order when the order couldn’t be fulfilled. I had suspected that may have happened to me before. Last November I ordered a new book bag shelf from target. Instead of a two tiered shelf they shipped a three tiered shelf. I tried to setup an exchange, but the two tiered shelf I wanted was out of stock. Some percentage of customers may have been happy with the three tiered shelf and decided to keep it, just like some might have been happy with the blue binkies, which would mean keeping the sale. Back in September I was shopping for a kids’ white astronaut costume. A number of reviews on amazon stated they received the wrong size, but overall the reviews were positive. The costume was listed with multiple sellers so I assumed if I ordered from one with a good rating I was probably safe. I guessed wrong. The seller claimed they had a mistake in their inventory system, but it seemed odd that the same problem kept occurring over multiple months. A part of me wonders if it’s not intentional. A few of the reviewers mentioned being stuck with the wrong costume. For some customers it isn’t worth the hassle to return it. The seller offered me a partial refund if I would consider keeping it. I would not, but if enough people do, the seller make still be making a small profit. For someone like me whose usually very deliberate in what she orders, these kinds of situations are incredibly frustrating. Anyway, if you happen to come across the above binkies in your travels you will be my very bestest best friend for life. Don’t buy online. The same experience has happened to me twice, from two different stores. I no longer trust online listings for binkies. It’s been years, but I suddenly find myself an active Shutterfly user again. It started with the Christmas cards. After nearly a decade of printing and addressing them myself, our home printer ran out of ink forcing me to look for an online alternative. That alternative turned out to be Shutterfly. It worked out well, and I returned to Shutterfly for last years’ cards as well, but I still had a mental block using them for my other printing needs. One afternoon while I was nursing Dana and browsing the internet aimlessly I started thinking about Santa plates. 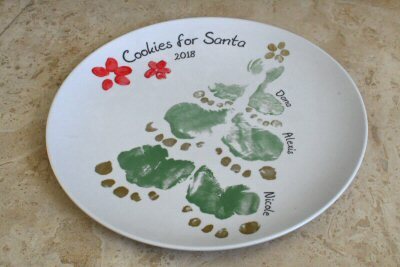 Since the first realization that my second child was going to be a wintertime baby I’ve been wanting to do a special Cookies for Santa plate. My first idea was a wreath made out of handprints, like this. Anticipating the difficulty of getting a few good hand prints, let alone many, and in the right pattern, my plan was to get the prints on paper first and figure out how to transfer them to the plate later. I tried custom stamps, and tracing paper with food safe ceramic paint. No dice. Not only did my ideas not work, but it left me with the awkward problem of figuring out what to do with the wasted plates. They are my kids’ hand and footprints after all. Three years later it suddenly dawned on me – design the plates on the computer and print them. Shutterfly had the best price again, so I whipped up a quick design and sent it off to the printers. I was super happy with the print quality, though my design left a little something to be desired. I promised myself I’d fix the design and buy a second plate with a coupon that seems to come every couple of weeks. A short while later an offer for a free puzzle (not including shipping) graced my inbox. I have been hoping to spark a love of puzzles in my kids, and a custom puzzle with their faces seemed like it might do the trick. The puzzle was great so I decided to order a framed canvas print (an image of one of the girls edited to look like water colors). I really liked the way Shutterfly’s canvas print appeared to be floating in the frame. None of the other places I looked at framed their canvases in the same way. Three orders in a handful of weeks! That’s when I started to become less enamored. The plate resist arrived with scratches and other minor cosmetic defects. I asked customer service for a reprint. They obliged, but not until I proved the presence of the scratches which I always find annoying. The reorder arrived with more noticeable splotches of extraneous color. Both where several steps below the quality of the first test plate. I will probably use the scratched plate since it has the design I like. The kids won’t notice or care about the scratches, and I can edit the scratches out any photos I take. If it annoys me too much I’ll look into having it printed elsewhere. My experience with the framed canvas print wasn’t much better. The frame cames without any kind of mechanism to hang it. No hooks, no wire of any kind. It wasn’t possible to just send the hooks, so Shutterfly is resent the print. The hook arrived in a plastic baggie staples to the frame. Plus side, I got to choose which frame I hung. Downside, both canvases had some pretty pronounced creases. To their credit, Shutterfly really does try and fix things. The dream book is out, and there’s not a single ornament I’m pinning over. Not. A. One. Snowball and Tuxedo? Not Christmas-y enough. Seasons treating? Meh, this chocolate lover isn’t impressed. Not a creature was storing? Don’t quiet get the match thing. The clock is ok, I guess. Mary’s bears? Kris’ Penguins? Cooks cutter Christmas? Not into them. I’m not even a fan of this year’s Baby’s first Christmas. I will purchase that one mostly out of obligation, much like I did with Alexis’. There are a couple ornaments that I’ll likely look for after the holiday. 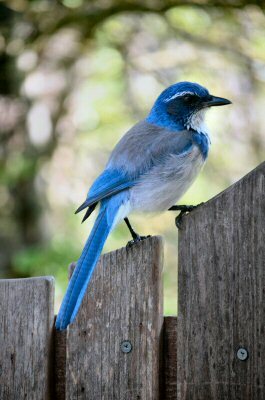 I like cozy critters blue jay since we have so many here. That’s so sweet snowman and sweet sled are the types of ornaments I typically go for on sale. I like them, but I’d be just as happy for next years version. No sense paying full price if I don’t have to. At least this year I’ll be able to go to an after Christmas sale. I never made it last year. Since I won’t be hallmarking, I am hoping to find the time for designing my own. I’ve been meaning to update our new home ornament. The initial design had a flaw which affected the print job, but that aside I still wasn’t too happy with it. The snow on top didn’t really come across as snow and the key had to be very thick to print in in sandstone. I am thinking of trying again in a clear acrylic hoping it will look like ice. The first is the photography company that does the school photos at Nicole’s school. The level of fail with these guys is impressive. I paid for Nicole’s Kindergarten portrait back at the end of August. I volunteered on picture day. I saw her get her photo taken and physically handed the check & order form to the photographer. In October Nicole’s teacher sent out an email reminding parents of retake day the next day in case they weren’t happy with their proofs. What proofs? I went through Nicole’s bookbag and the parent folder. Nothing. I double checked my check had been cashed in August. Fearing a mixup I signed Nicole up for retakes, just in case. Worse comes to worse I’d pay for two sets of photos. First thing in the morning I called the company asking about the missing proofs. They didn’t have a record of Nicole having her photo taken (besides the cashed check) but it didn’t seem like this situation was too unusual, and they said they’d look into it. In early November I got an email from the photography company. They couldn’t find Nicole’s missing photo and would be returning my money. I asked if they had her photo from retake day. No response. In December, a full 3 months after I paid for the silly things, I finally received Nicole’s official Kindergarten portraits. They were all the quality you’d expect from a school photo, but at least they were non-theoretical! The company takes the kids’ photos against a green screen, so I decided to order another image with a different color background that goes better with Nicole’s complexion. Unlike my first order, this one came quickly, but came watermarked! Tomorrow I will be calling and asking for the Non-watermarked version. The second issue is with my Target bookshelf order. Domingo and I are setting up a Homework/project nook area in the living room. We needed a place to store Nicole’s book bag that wasn’t the middle of the floor (where it currently is.) The space is small, and there’s a window with a ledge so I needed the two-tiered, 2 shelf case. The 3-tiered one arrived. I’m sure in most cases that would be a nice surprise upgrade, but it doesn’t fit! The final issue is with the light up deer lawn decorations we ordered. The baby deer is missing a piece. Not an important piece, we can make do without it, but we shouldn’t have to! And the photography company continues to impress me with their level of fail. The customer service rep kept insisting that all images come watermarked (then why didn’t my first order?) and Walmart (their suggestion) can remove the watermark for me if I were to take the digital image file to them to print (Ridiculous. The technology to do it is in it’s infancy and not publicly available. Besides, there are legal implications for a commercial entity to remove someone else’s watermark). We are out of luck with the bookshelf. The two tiered version is out of stock, and no longer listed on Target’s page. I’m dissappointed because it was an awesome deal on a really cute bookshelf that’s twice as expensive anywhere else, but they’re letting me keep the three tiered one for free. I can maybe make it work somewhere else in the house, just not for the intended purpose. At least I’m no worse off than if I hadn’t ordered it. The missing part on the baby deer is also out of stock and the company isn’t sure when they’ll be able to restock it, so it may be a while before they can send one to me. Luckily we can make do without. I had given up getting a resolution with respect to Nicole’s photos, but then I got a response back from the Photography company this (Tuesday) morning that irritated me so much I couldn’t let it go. Eight more back-and-forths and we may have reached a resolution I’m satisfied with. Despite early online successes, in person Black Friday shopping this year was a colossal failure. I was able to get a sale as good, or better than I was expecting on pretty much everything on my list through online shopping. I had sorted all our old baby clothes, knew what we were missing, and took advantage of the sales to flush out Z3’s early wardrobe. I opted to skip most of the baby gear on our list in favor of just in time decisions based on what we need. Since Z3 is our last, there’s no point in stocking up in what we might need. The monitor is the clear need, but a simple security camera will likely suffice and can stream to our phones which means one less component that could fail. By the time the kids were in bed Thursday night, there was just one thing left on my list: my new phone. We arrived at Target at 7:30 pm, about 90 minutes after the doors opened. I was surprised to see a line still outside the door. My heart sank when we noticed it was the iphone line. Not a good sign to begin with, and our night was about to get even worse. We have never waited in a Black Friday sale before, let alone at nearly 8 months pregnant. I wasn’t sure how long I could hold out with Z3 compressing my internal organs. Simply standing can be exhausting. As we stood in line I started the timer on my phone. I wanted to be able to estimate how much longer we would likely weight if I felt like I was maxing out my capabilities. We alternated between both of us standing in line, and me sitting on the nearby bench while Domingo held our place. At 31 minutes, 30.11 seconds one of the Target employees made an announcement. It turns out the line we were in was the pre-line line. When we got to the front they’d check our eligibility for an upgrade, and verify they still had the phone we wanted (network, color, memory size, etc) in stock. Then we’d enter the actual line, an virtual queue. At some point later we’d get a text/call that we were next and have 15 minutes to make our way to the counter and claim the phone, otherwise our spot was forfeit. It could be any time between then (8pm) and midnight, or after 6 am the next day. The employee’s best guess was the next day. We abandoned all hope and left the line. I couldn’t spend that much time at Target, and if we went home it was unlikely we’d be able to return promptly in fifteen minutes, and that’s assuming I didn’t miss the call/text. I didn’t want to feel pressured into getting a different size, or color than I wanted, and worried I’d be told the phone was in stock, only to discover it wasn’t once I arrived. But I was still disappointing, and as we returned home I started to second guess myself. There was no guarantee the call/text would come at a bad time. I might have been able to get my phone had we stayed in line, I definitely wouldn’t by exiting the line. On Friday I read a market watch article talking about the frustrations many customers had purchasing their phones. Even those who were in line before the doors opened were waiting for hours. I felt a little better for not sticking it out. It sounded like a miserable experience. Saturday I realized we had forgotten candles for Alexis’ birthday cake and had to send Domingo to the store for an emergency pick up. The party aisle is right by the electronics section and he couldn’t help but overhear one of the annoyed customers. The customers had been summoned to pick up his iPhone twice. The first time, despite being told the phone he wanted was in stock and ready to be picked up he arrived at Target only to discover they had made a mistake and did not have that particular phone after all. This was his second call back. One of the other customers had returned their phones, but there was some issue surrounding the fact that it was a returned, already activated phone. Another clearly miserable experience. I’m disapointed I didn’t get a new phone, but if I could only have one new phone or a new camera, I’m much happier with the new camera. In early November I got in the habit of leaving a separate browser open dedicated to shopping. I was interested in a pumpkin Halloween decoration that was strangely not on clearance sale yet, and considering getting some out door artificial pencil width trees to go on either side of the front door. I had a tab opened to each product I was considering, waiting to see if it would go on sale. While I was at it, I decided to add some tabs for some of the Black Friday things I was considering. I wasn’t expecting a deal yet, but I like to be organized. We were planning on purchasing a Samsung S8 for Domingo for the Black Friday sale price of $300 off. I calculated the monthly rate to be ~$17. As I was scrolling through my shopping tabs in the morning of the 16th, a full week before thanksgiving, I noticed Bestbuy offering the phone for ~$15 a month, or $350 off. I purchased it without hesitation. Bestbuy had jumped the gun and beaten their own advertised price which was already the best around! Another deal I was considering was an Artificial tree from Michaels. One of our trees last year quit working thanks to faulty wiring in the plug. I was debating about restring the lights (a deceptively huge endeavor.) At the beginning of November Micheals had some kind of “tree event”. Domingo and I went to the store and really liked on of the trees which was an extremely reasonable price. “Was” being key. The tree was 50% off the day before, now only 25% off. It was still a good price, but not the best price. I often will balk at a purchase if it’s not the best price, regardless of how good it is. A little internet research suggested the price would come back down on Black Friday. Sure enough, when the Black Friday flyer finally came back the tree was once again advertised as 50% off. I opened a tab and was at the ready. The deal started Sunday, a full five days before it was advertised to start. That’s just three examples. Here we are, the day before thanksgiving and I’ve gotten most of the items off my Black Friday shopping list at the price I was expecting, or better. On the one hand, I will miss the tradition of going out to the store on Thanksgiving night after the kids are in bed. On the other, I look forward to having more time in the evening for our other tradition, trimming the trees up while the kids are sleeping. It’s time to start thinking about baby gear! Z3 will be here before we know it. A New Baby Monitor System. I loved our old monitor, really I did, but it’s showing it’s age and barely functional at this point. The parent console often loses signal and sometimes can’t process the image feed. We’re left with a ghostly white image that lingers on the screen. I’ve gotten used to enough that I can guess what’s going on in the room. Usually. If that’s not enough of a draw back, the night time vision of one of the cameras is about half power, and whenever the parent console is connected to that monitor it picks up an intermittent buzzing that keeps me awake. Since the girls are in the shared big girl room, we’ve just been using the working camera. A new high chair. I hated our old one. We were going to pitch it and replace it before Alexis was born, but my frugal tendencies took over and saved it from the dumpster. The padding is now ripped, so I think I can finally give myself permission to part with it. I have no idea what kind of high chair I’ll look for next aside from cheaper and simpler. A crib. The old one is ok, but with the non standard screws I can make a case why it should be replaced. It’s also been chewed on quiet heavily, and shows the wear of having been used for two kids already. Normally I’m fine with cosmetic defects, but I know I’m going to want to take photos of a sleeping baby in her crib. A bottle warmer. These things always seem to get so gross. Looks like each kid will be getting her own. Another rocking chair. One can never have too many rocking chairs. The first one we purchased is downstairs in our living room, and still comfortable but showing it’s age. We purchased a second one that is currently in the nursery, but that’s in the middle of the house. And also not very comfortable, if I’m being honest. I’m thinking about getting a third one for the master bedroom since Z3 will probably sleep in there for a few months (I know, it’s a total splurge.) I figure I’ll use the new one to replace the one downstairs at some point. I’m kind of amazed that the jumperoo is still in good shape, and Alexis’ activity gym given how Nicole destroyed hers. It sometimes feels like those are the only two things that survived. The rock n’ play is doing okay, but the fabric just isn’t as nice as it once was. Alexis’ changing pad is also in ok shape. We recently purchased a new crib mattress before moving Alexis to a twin size, so at least we’re good there. Between Nicole’s birthday, and the new baby I’ve been pretty distracted. I haven’t really been thinking about shopping or Christmas, which explains why the Hallmark Ornament Premier skipped my mind this past weekend. Since I had some time available this morning I went to our local hallmark store. It wasn’t until I was standing in front of a shelf at ornaments unable to spot a single ornament I was interested in that I realized I wasn’t even sure which ornaments were supposed to be available in July, and which were coming out in October. Fortunately, I had my previous blog post which could serve as a list. Most of the ornaments I wanted were coming out in October, not July. Serves me right for not being prepared. Cookies for Santa, should have been available now, but there wasn’t a single one at the hallmark store. Not even on display They couldn’t be sold out already, could they? I asked, apparently it was a shipping mishap. They hadn’t received any of the Cookies for Santa ornament, and suggested I try back in a week. Instead I drove to our next closest Hallmark store. The second hallmark store was a little further away, but not a Hallmark Gold Store, which meant they sometimes bent the rules and sold members only ornaments without memberships. They had Cookies for Santa, and Father Christmas’ Reindeer which was huge, much larger than I anticipated and way to big for our tree. Despite liking the ornament I had to pass. They also had inside story for individual sale, which wasn’t as mustard yellow as I was expecting, but still too yellow for my tastes. I wasn’t initially planning on getting Sweet Lil Santa, but at this point I had been to two Hallmark stores and only had one ornament to show for it. At least it was inexpensive and would match my other gumdrop ornaments. Despite my initial excitement the July premiere ended up being a bit of a bust. The ornaments I was on the fence about initially, I remained on the fence with. Some of the ornaments I initially loved, didn’t work out. Nothing new struck my fancy. Hopefully the October premiere will meet expectations better.